WASHINGTON, Jun 27 2013 (IPS) - Citing Bangladesh’s alleged failure to respect international labour rights, U.S. President Barack Obama Thursday suspended trade benefits for the South Asian country’s exports under the Generalised System of Preferences (GSP). The move came two months after the collapse of a building, the Rana Plaza, in Dhaka that killed more than 1,200 textile and garment workers. The disaster, which followed last November’s fire that killed 112 workers at the Tazreen garment factor, drew unprecedented attention to labour conditions in Bangladesh’s fast-growing apparel industry and to the major western retailers that are its chief customers. “I have determined that it is appropriate to suspend Bangladesh’s designation as a beneficiary developing country under the GSP program because it is not taking steps to afford internationally recognised worker rights to workers in the country,” Obama, who is currently on a tour of Africa, said in a statement issued by the White House. “The recent tragedies that needlessly took the lives of over 1,200 Bangladeshi garment factory workers have served to highlight some of the serious shortcomings in worker rights and workplace safety standards in Bangladesh,” said U.S. Trade Representative (USTR) Michael Froman after the White House announcement. He noted that Washington would begin “new discussions with the government of Bangladesh regarding steps to improve the worker rights environment in Bangladesh so that GSP benefits can be restored and tragedies like the Rana Plaza building collapse and Tazreen Fashion factory fire can be prevented”. The direct impact of Thursday’s decision, which followed a multi-year USTR review initiated by U.S. labour unions that have long complained about working conditions in Bangladesh, is likely to be minimal, since the country’s apparel exports – its biggest industry by far – are not covered by Washington’s GSP programme. “GSP doesn’t cover sensitive products like apparel,” said Dan Anthony of the Coalition for GSP, a lobby group for U.S. companies that benefit from GSP, which provides about 750 million dollars a year in tariff relief for products from developing countries. Last year, importers of Bangladeshi products received about 35 million dollars in GSP benefits. Of that total, the tobacco sector was the largest beneficiary, accounting for over 11 million dollars in exports. Exports of golf equipment, porcelain and china hotel and restaurant tableware, and plastic bags each received around five million dollars in GSP benefits, according to Anthony. While the total represented less than one percent of the more than four billion dollars in apparel goods imported to the United States from Bangladesh last year, the indirect effects of the GSP suspension are likely to be much greater, according to labour activists and their supporters. “The decision to suspend trade benefits sends an important message to our trading partners,” according to a statement released by the Richard Trumka, the head of the AFL-CIO, the largest U.S. trade confederation which initiated the government’s review of Bangladesh’s labour conditions more than six years ago. “Countries that benefit from preferential trade programmes must comply with their terms. Countries that tolerate dangerous and even deadly – working conditions and deny basic workers’ rights, especially the right to freedom of association, will risk losing preferential access to the U.S. market,” he said. Others stressed that the decision will exert renewed pressure on U.S. apparel companies to adhere to binding agreements regarding their responsibility to improve and oversee working conditions in the garment factories, including the Accord on Fire and Building Safety in Bangladesh (Safety Accord) that has been signed by several dozen mainly European retailers, such as H&M, Primark and the Benetton Group, since it was concluded last month. “While the decision is an important step by the U.S. government, the decision alone may not ensure that action will be taken to end the epidemic of senseless deaths of Bangladesh’s garment workers,” said Liana Foxvog, organising director at the International Labour Rights Forum (ILRF) here. “As a next step, we ask the U.S. government to call on U.S. companies like Gap and Walmart to make legally binding commitments to invest in the future of Bangladesh garment workers by joining the Safety Accord,” she said. Most major U.S. companies have so far declined to sign the accord due to concerns that disputes could wind up before U.S. courts that could grant huge damages for non-compliance. Bangladesh is currently the world’s second biggest apparel exporter, with an estimated 5,000 textile plants. 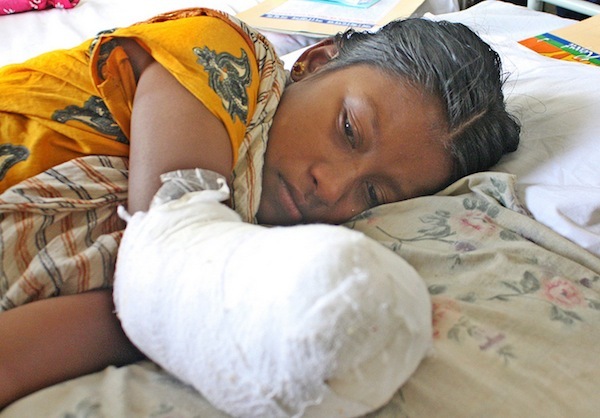 Since last November, more than 1,500 workers have died in fires and the Rana Plaza collapse. In documents submitted to the USTR, the Bangladeshi government itself admitted that the rapid expansion of the textile industry “has outstripped the pace of our progress” in ensuring adequate regulation and oversight. For all of the country’s plants to meet minimum safety standards, improvements will cost on the order of about three billion dollars – or an average of 600,000 dollars per factory, according to labour activists who worked on the Safety Accord. That accord requires signatories to pay for all of the improvements. The Wall Street Journal reported Thursday that major U.S. retailers, including Wal-Mart and Gap, are expected to reach their own accord next month that would establish a 50-million-dollar, five-year fund to support the needed improvements. Unlike the Safety Accord, the proposed plan would strictly limit the circumstances under which any disputes could be taken up by U.S. courts and limit the liability they could face there. Activists consider the U.S. plan, which is being negotiated with the help of the Bipartisan Policy Centre, to be inadequate in almost every respect. Last week, 113 organisations sent a letter to Secretary of State John Kerry urging the administration to support the Safety Accord. Public demonstrations against the recalcitrant companies are being organised in front of their stores in 30 U.S. cities as part of the International Day of Action to End Deathtraps. Labour activists stress that safety is not the only challenge workers in Bangladesh face. Threats and violence against union organisers are also common. Last month, the International Labour Organisation and the World Bank rejected Bangladesh’s application to join their “Better Work” programme, which carries out unannounced inspections of textile factories, complaining that the countries labour laws were too weak and repression against union organisers too great to warrant the country’s membership.